On Wednesday 19th February, the Stirling Smith was lucky enough to be visited by Eve Haddow, Assistant Curator at National Museums Scotland. Eve has been working on the Pacific Collections Review- a project dedicated to increasing information on and exploring the relationships between collections based on the Pacific islands in Scottish museums. 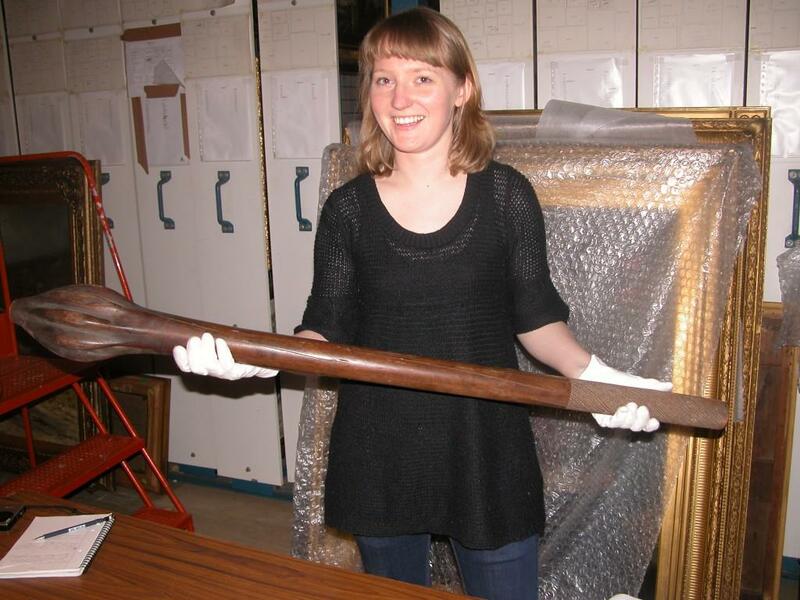 Although the core museums of the project are National Museums Scotland, Aberdeen University Museums, Glasgow Life and Perth Museum and Art Gallery, Eve’s widening research brought her to the Smith to have a look at some of the hidden treasures in its collection. 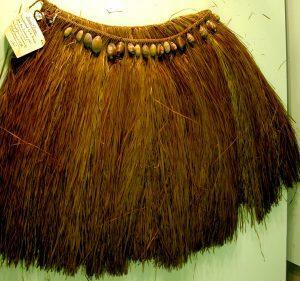 Here is a Maori skirt. The red and purple colour of the straw indicates that it is a woman’s skirt. By looking at the weaving on the top we can identify the island it derives from. This is a Kap Kap from the Solomon Islands. 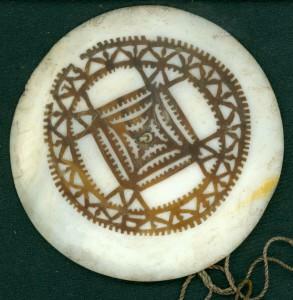 The geometric pattern on top of the disc is made from the malleable shell of a turtle. Kap Kaps would traditionally be used as a means of personal ornaments. The one in the collection would have been held to an islander’s forehead with either a headband or a form of cord. There was great excitement at the discovery of a Lime Spatula that had been kept in excellent condition. The lime spatula is a type of flat spoon which is typically used to assist in the chewing of the Betel nut. The beaded chain decoration hanging on its handle indicates its importance to the family who originally owned it. There are an extensive range of Pacific war clubs in the collection. While the heavier clubs were used as weapons, it is feasible that the lighter ones were used for ceremonial dances instead. 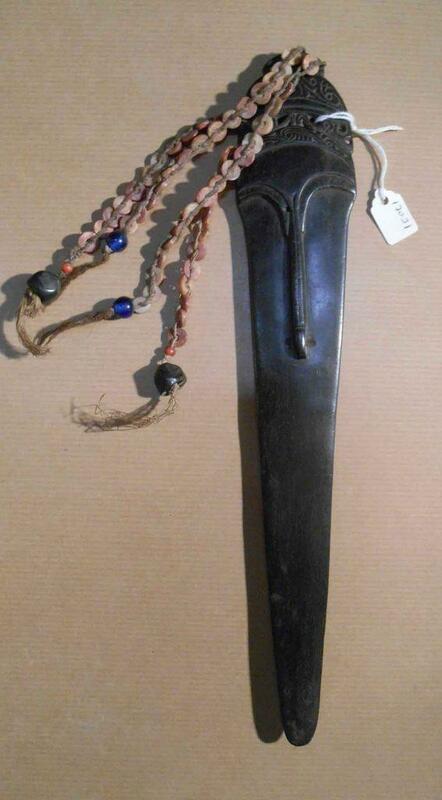 Although there were no markings on the side of any in our collection, there is a theory that scratches on the sides of the war clubs show the number of people killed by its owner. There are carved details into the sides of several of the clubs. One shows a chief holding what appears to be a fishing spear. is the Frigatebird, a seabird which populates the Pacific. The final discovery of the day was a shield from Borneo (not the Pacific). The bunches of hair attached to its surface are in fact human hair. There are paintings of people on the inside of the shield. This was based on the superstition that the people in the paintings would protect the wearer from harm. Blog post by Christian Duffy – Collections Volunteer.